Franklin: "… Wanderlei Has Lost a Step"
Did the always-respectful Rich Franklin really utter those words about his UFC 99 opponent? Well, kinda sorta. 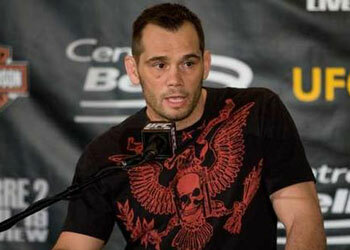 Read what the former UFC middleweight king had to say about facing Wanderlei Silva this Saturday in Cologne, Germany. The one that Franklin is referring to would be his impressive knockout of Keith Jardine at UFC 84 last May. Although that is the only W the former Pride FC champ has posted in his previous five scraps, Franklin is prepared to face Wandy circa 2002. That was the Brazilian’s most dominating period of work as he went an astonishing 17-1-1 against some of the world’s best fighters in Japan. Franklin, the former math teacher, has extensively studied Silva for quite some time and he is ready to apply what he has learned. “We’ve all seen Wanderlei fight many times,” Franklin said of Silva’s tendancies. “You know what he’s going to do. He’s going to time some things and then he’s going to come in with his combinations, at which point if he lands, great. If he doesn’t land, he’s going to look to tie-up in the clinch and start throwing some knees. Sounds like he knows exactly what to do in their 195-pound catchweight fight. All that’s left is the simple task of applying it.